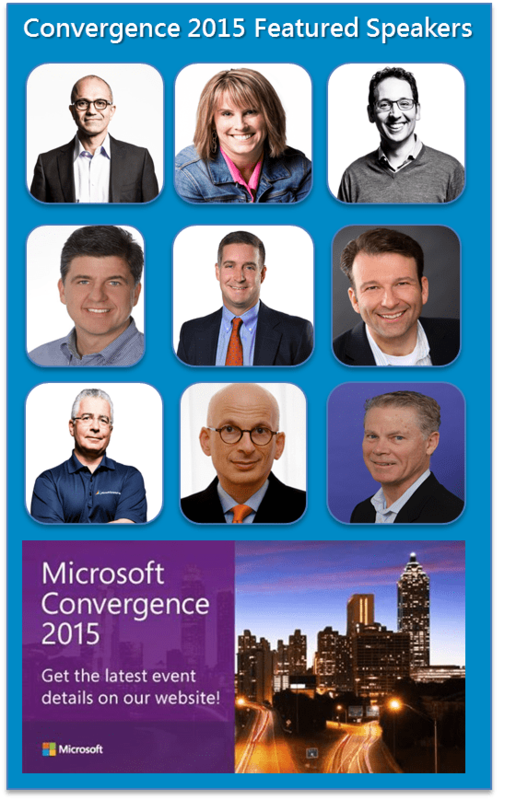 On March 16th – 19th over 12,000 current and future Microsoft Dynamics users will ascend on the Georgia World Congress Center in Atlanta, GA for Convergence 2015 (#Conv15 for all your Twitter people out there). With hundreds of sessions scheduled and an expo hall filled to the brim with partners ready to talk to attendees about ways to accelerate their business, here are nine featured speakers who will be sharing their experiences and their vision with Convergence 2015 attendees from the big stage. If you want to know more about each of these speakers you can see their full bio’s at the Convergence 2015 – Featured Speakers web page. If you are already registered or planning to attend (and just haven’t gotten around to registering yet) we look forward to seeing you in Atlanta! Stop by our Ledgeview Partners’ Dynamics CRM booth #1322. If you are not registered to attend Microsoft Convergence 2015 what are you waiting for?